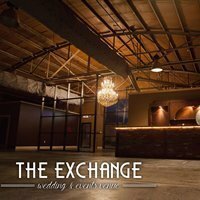 The Exchange is a stunning industrial-chic event venue located in Lake of the Ozarks, MO. With over 6,000 square feet of versatile space and many notable features, your event will be full of charm and character. Let your vision and creativity flow or just enjoy the simple elegance of the gorgeous chandelier, exposed brick, stained concrete, and other stylish details fit for your wedding or any other special occasion.